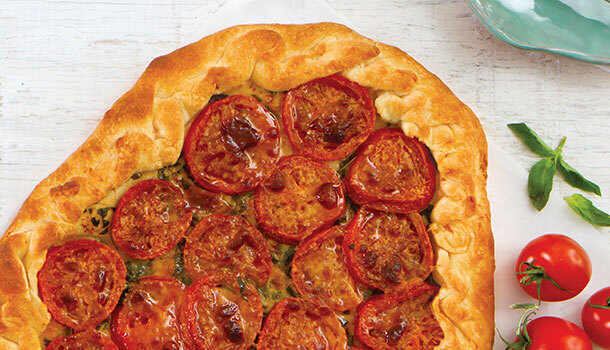 This Creole Tomato Galette will wow guests at your next summer soiree. 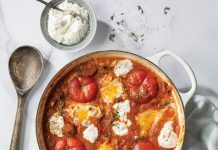 A delicious way to enjoy Creole tomatoes. Place oven rack to upper-middle position. Preheat oven to 425°. In the work bowl of a food processor, combine flour, sugar, 1 teaspoon salt, and butter. Pulse until the mixture is uniform and resembles coarse meal. Slowly add ¼ cup cold water, and pulse until smooth. If needed, add additional water, 1 tablespoon at a time, until dough comes together. Do not overwork dough. 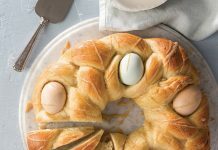 On a lightly floured surface, roll out dough into a 16-inch circle. Sprinkle tomato slices with lemon juice, remaining 1 teaspoon salt, and pepper. Brush dough with olive oil. Spread basil over dough. Layer tomato slices over dough, leaving a 2-inch border. Overlap edges of tomato slices to make them fit dough. Brush exposed dough with olive oil. Fold dough edges over tomato filling, gathering and pleating dough, if necessary. Sprinkle with Parmesan, and bake 30 to 35 minutes. Serve warm or at room temperature. If those tomatoes are as sweet as my Creole tomatoes are that sugar will turn it into a desert! Can the Creole tomatoes be grown in AZ? If so, where can I get seeds. If not, what other kind of tomatoes can be used? That is an excellent question that requires a long answer. Technically there is no one type of “Creole” tomato (the LSU AgCenter produced a “Creole” variety in the 1960s but it isn’t widely planted anymore). 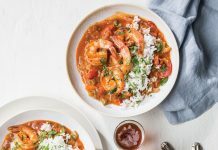 When people talk about Creole tomatoes, they are typically referring to tomatoes from Southeast Louisiana, grown in the region’s rich soil, not necessarily the actual type of tomato. That said, Celebrity tomatoes are one of the most common types of Creole tomatoes and you could probably grow it under the right circumstances in Arizona. We hope that helps!